Bajaj Auto chairman Rahul Bajaj is not too happy with his son's decision to phase out the company's iconic scooters, but feels the decision of Rajiv Bajaj will be in the interest of the company at large. "I am not convinced phasing out scooters is the right solution. I differ with Rajiv's judgement, even if it may be better. I feel bad and hurt that a brand like Bajaj scooters is out," Rahul Bajaj said in an interview to a TV news channel. "I can't harm the company, its shareholders and employees. The emotional connect says do something to keep scooters going. There is a disconnect, difference of generation gap. Who knows tomorrow we may come back with a bang," says Rahul Bajaj. 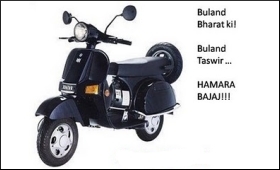 Bajaj's son Rajiv announced a few days ago that the company will totally hive-off the business that made "hamara Bajaj" a household name and concentrate on emerging as the largest producers of motorbikes in the world. Rajiv has told the news channel that scooters was not a profitable space to be in anymore. "People stopped buying scooters, so we stopped making them. I care less for solution from emotion and more for magic of logic. We may come back with a new category of scooters," he said.